I cannot tell y'all how many times I checked The False Prince out from my library only to have return it. (view spoiler) I don't know why I decided to check it out the other day when I knew I wasn't going to read it. Plot twist: I READ IT! And, my god, it was awesome. I opened The False Prince expecting to merely skim it but found myself awake in the middle of the night reading it. It was so hard for me to put it down... until I was finished. The False Prince gives us a promising story. Sage is completely awesome -- I loved his quick retorts, his braveness, and his honour (view spoiler). Sage is a 14 (15?) year old orphan pickpocket from Avenian but travelled to Carthya to live. Upon doing what he usually did (steal food, money, etc. ), a nobleman from court, Conner, finds him and takes him (along with three other boys). His reason? To fool an entire kingdom that he has the king's long-lost son. The boys are taken to Conner's palace to be trained as a prince would. The boys have no choice but to stay unless, that is, they want to be killed. Each of the boys has their own personality that I admired and I really like that (usually most YA novels I read the characters have the same boring personality). There's Roden: strong and boastful, he's doesn't know how to read, but he sure does know how to use a sword. Tobias: curious and smart. He's the only boy of the four who can read. Though he can read any book you give him, he certainly can't use any sword you hand him. Latamar: quiet and feeble. We don't learn much about him (view spoiler). Then there's Sage: defiant and cunning. He knows how to read a little; as well as know how to use a sword. He's a quick theif and knows how to slip in and out of the palace without anyone knowing he left. Each of the boys possess a quality the prince had, but only one can fool the entire kingdom. 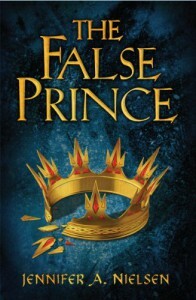 EDIT NOVEMBER 23RD, 2012 Oh ho ho, I see what the publishers did there -- publishing The False Prince on April Fools when the story is about fooling an entire kingdom. Classic.